Secure data destruction and elimination products from Fractalio Data Pvt. Ltd. Secure data elimination using NSA level erasure technology from the world leader in data degaussers and destroyers. How is the data eliminated? - Is there a risk, really? Defective and retired data storage devices (hard disks, tapes, SSDs, pen drives), once removed from servers, storage systems, desktops, laptops etc. present a potent and potentially massive source of data leakage. Organizations can face severe penalties for data leakage of current or even old data. To safeguard your company and ensure compliance with data protection laws, it is essential to securely and completely destroy unwanted data that may reside on retired storage devices. 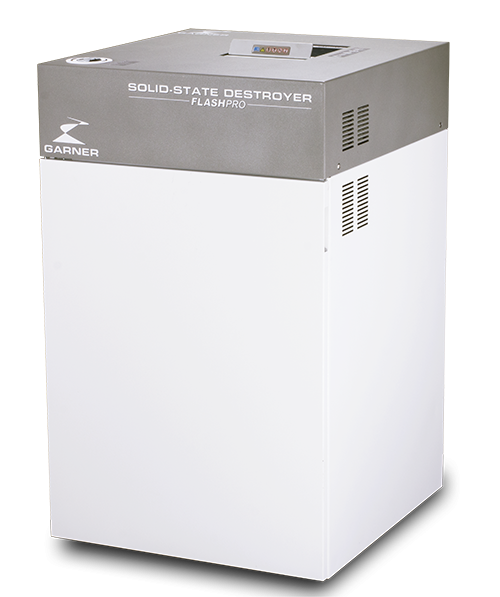 The FLASHPRO is a high-volume destroyer specifically designed to shred digital media in an office environment. The FlashPro destroys a wide variety of media including smartphones, mini-tablets (up to 170 mm in width), USB sticks, solid-state drives (SSD), and optical media. 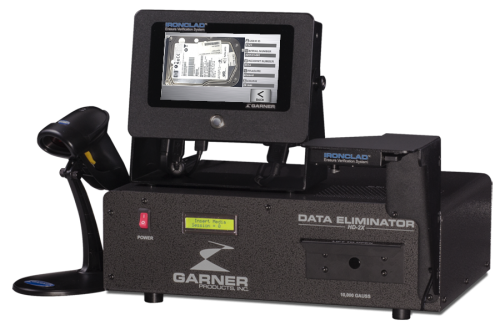 The Mobile Destruction Unit featuring IRONCLAD® erasure verification system. 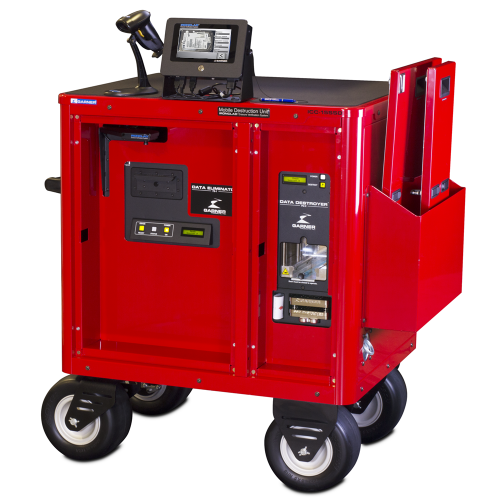 Simply roll the cart to the media, plug the cart into a standard wall outlet, and begin the data destruction process while automatically generating an IRONCLAD® proof-of-erasure report. Your business team will face any security audit with confidence. How is data eliminated from storage devices? Data is stored in the magnetic media, such as hard drives and magnetic tape, by making very small areas called magnetic domains change their magnetic alignment to be in the direction of an applied magnetic field. This phenomenon occurs in much the same way a compass needle points in the direction of the Earth's magnetic field. Degaussing, commonly called erasure, leaves the domains in random patterns with no preference to orientation, thereby rendering previous data unrecoverable. There are some domains whose magnetic alignment is not randomized after degaussing. The information these domains represent is commonly called magnetic remanence or remanent magnetization. A well designed degaussing system will ensure there is insufficient magnetic remanence to reconstruct the data. Unlike magnetic storage devices such as hard disk drives and tape, data on solid-state drives (SSD), USB sticks & "thumb" drives is stored electrically, and cannot be erased using a magnetic degausser. Data on these devices can only be eliminated by inflicting sufficient physical damage to the device, that prevents any possibility of data recovery. This is achieved by either puncturing the device at small physical intervals, thereby inflicting damage to each data cell (a typical solid state storage device consists of a collection of such cells logically aggregated as a single device), or by complete shredding of the device, ensuring irreversible data destruction. - Patented solid-state destroyer with 90 spikes to puncture, perforate, and waffle media, demolishing the individual memory chips so data cannot be retrieved. 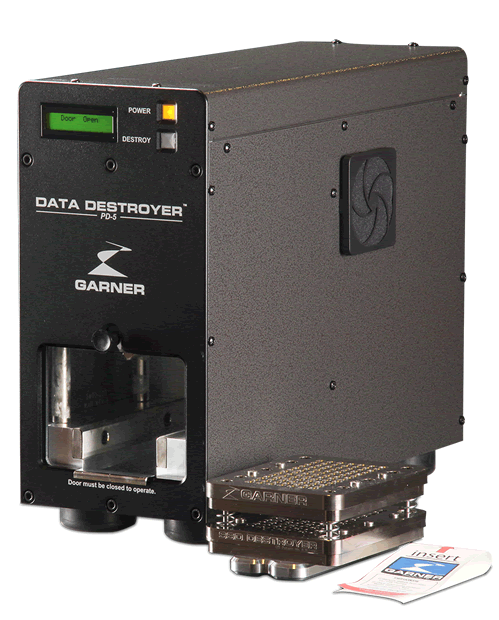 Garner offers equipment rental and data destruction services for small businesses, economical degaussers and destroyers for small- to mid-size companies, and NSA/CSS EPL-listed equipment that meets the data security requirements of multinational enterprises, government contractors and the United States government. 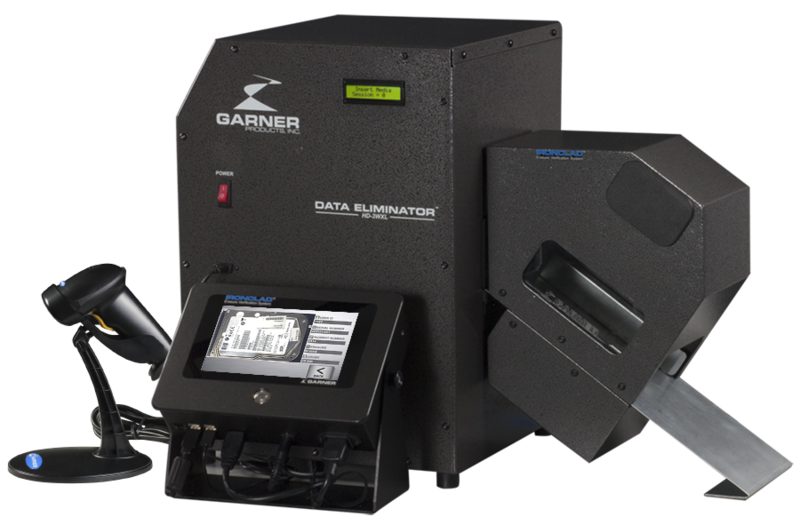 Garner has worked for more than half a century designing and improving its line of degaussers and destroyers. Garner's products have been tested and certified by independent labs to meet safety and electromagnetic emissions standards worldwide.